Four months after the Turkish military, working with U.S. Intelligence, bombed a civilian convoy incorrectly identified as Kurdish militants, survivors and relatives are demanding answers. Reporting and video by WSJ’s Joe Parkinson in Uludere, Turkey. ULUDERE, Turkey—After winding along a narrow mountain ridge, a caravan of 38 men and mules paused on the Turkish-Iraqi border. Then they heard the propellers overhead. Minutes later, Turkish military aircraft dropped bombs that killed all but four of the men. The strike in late December was meant to knock out Kurdish separatist fighters. Instead it killed civilians smuggling gasoline, a tragic blunder in Turkey’s nearly three-decade campaign against the guerrillas. The killings ignited protests across the country and prompted wide-ranging official inquiries. The civilian toll also set off alarms at the Pentagon: It was a U.S. Predator drone that spotted the men and pack animals, officials said, and American officers alerted Turkey. A Turkish strike to knock out Kurdish separatist fighters instead killed civilians smuggling gasoline. The blunder has been linked to intelligence from U.S. drones in the region and raised questions about their value. WSJ’s Joe Parkinson reports. The U.S. role, which hasn‘t previously been reported, revealed the risks in a new strategy for extending American influence around the globe. It raises an outstanding question for the White House and Congress: How far do we entrust allies with our deadly drone technology? After a decade of troop-intensive land wars, the Obama administration is promoting advanced drones, elite special forces and intelligence resources as a more nimble, and less expensive, source of military power. The strategy relies heavily on close cooperation with regional allies, in part to reduce the need for American troops on the ground. In Pakistan and Somalia, where local authorities can‘t or won‘t act against militants, the U.S. employs armed drones and special-operations teams to track and kill suspected terrorists. In Yemen, the U.S. carries out drone strikes with the government’s approval. In Turkey—a North Atlantic Treaty Organization member that has a modern air force—the U.S. helps provide intelligence for operations but plays no direct role in any strikes. The downside to such arrangements, say current and former U.S. officials, is that countries can use U.S. intelligence in ways the Pentagon and the Central Intelligence Agency can‘t control. Allies have varying standards for deciding who is a justified target. And these partnerships can embroil the U.S. in local disputes with only slender links to the security of Americans. „What happens if this information gets to the [foreign] government and they do something wrong with it, or it gets into the hands of someone who does something wrong with it?“ said Rep. Mike Rogers (R., Mich.), chairman of the House Intelligence Committee, who didn‘t know specific details of the attack. The conflict between Turkish security forces and the outlawed Kurdistan Workers‘ Party, or PKK, has taken an estimated 40,000 lives since violence first flared in the 1980s. Ethnic Kurds, about 18% of Turkey’s population, have long sought a degree of political autonomy and the right to public education in their native tongue. Tensions have risen since Turkey last fall intensified its campaign against the PKK, which the U.S. and European Union designate a terrorist group. U.S. drone flights in support of Turkey date from November 2007, when the Bush administration set up what is called a Combined Intelligence Fusion Cell in Ankara, part of an effort to nurture ties with the government led by Prime Minister Recep Tayyip Erdogan. U.S. and Turkish officers sit side by side in the dimly lighted complex monitoring real-time video feeds from Predator drones. The Obama administration has moved to expand cooperation—by stepping up intelligence sharing and by supporting Turkey’s request to buy armed and unarmed U.S. drones to give the Turks full control. The issue is sensitive for both sides. Turkey doesn‘t want to be seen as reliant on the U.S. And selling drones to Turkey faces opposition from key members of Congress, who worry about spreading the technology, as well as Turkey’s standards for deciding when to launch a strike. While the White House is moving forward with plans to provide Italy with arms for its drones, proposals to sell or lease drones to Turkey face resistance in Congress, which reviews such sales in advance. Proponents argue they build long-term military relations with close allies, as well as give U.S. companies better access to the fast-growing global market. The caravan strike is illustrative of the dangers. Servet Encu, 42 years old, said he had made the journey across the mountainous border separating Turkey and Iraq several times a month since he was a teenager, smuggling all kinds of goods. In his and other impoverished Kurdish villages of southeastern Turkey, smuggling is a trade made profitable by differences between the two countries, including taxes and currency values. Fuel costs twice as much in Turkey as in Iraq, a substantial oil producer, rewarding smugglers who ferry jugs of gasoline through the mountains. The Turkish military usually doesn‘t bother villagers crossing the border, as long as they aren‘t smuggling weapons or drugs. But PKK militants also cross the border in the region. The convoy, laden with food and gasoline, was returning to Turkey on Dec. 28. They were less than an hour from home after hiking along barren, icy ridges for more than four hours, Mr. Encu said in an interview. Mr. Encu called his Kurdish village by cellphone for help picking a route to avoid Turkish soldiers who might confiscate their cargo, he recalled. Above and out of sight, a U.S. Predator drone loitered. It was on a routine patrol when U.S. personnel monitoring its video feeds spotted the caravan just inside Iraq and moving toward the Turkish border, according to U.S. officials and the Pentagon’s assessment of the fatal strike. U.S. military officers at the Fusion Cell in Ankara couldn‘t tell whether the men, bundled in heavy jackets, were civilians or guerrilla fighters. But their location in an area frequented by guerrilla fighters raised suspicions. The Americans alerted their Turkish counterparts. U.S. officials said additional surveillance from the Predator might have helped the Turks better identify the convoy. But, they said, Turkish officers instead directed the Americans who were remotely piloting the drone to fly it somewhere else. U.S. officials said compliance with the Turks‘ request was standard procedure. As darkness fell, Mr. Encu said, the men in the caravan heard the dull hum of Herons—the Israeli-made surveillance aircraft used by Turkey and less sophisticated than U.S. drones. The strikes lasted for about 40 minutes, survivors said. Of the 34 men killed, 11 were members of Mr. Encu’s extended family. It was the largest number of Kurdish civilians killed in a single attack in Turkey’s long conflict with the region’s militants. Rescuers dug for corpses under a collapsed mountain ridge. They wrapped body parts and loaded them on a trailer that was towed to the nearest village, according to accounts of residents and local officials. The killings sparked clashes between hundreds of stone-throwing protesters and the police in Kurdish parts of Turkey. In the town of Uludere, Mayor Fehmi Yaman charged that the attack marked the latest in a series of government efforts to intimidate the local population, much of which supports Kurdish militancy. „The military knew these people were civilians. It was a deliberate attack,“ he said. „The troubled by Turkish standards for selecting targets. The former official said Turkish officers sometimes picked targets based on a notion of „guilt by association“ with the PKK. U.S. personnel work in the Ankara Fusion Cell, in part, to monitor Turkey’s use of U.S. intelligence, U.S. officials said. Turkish officials have assured the U.S. of their measures to avoid civilian casualties. They say privately that Predator drones help reduce attacks on the PKK using less precise weapons, such as artillery. But U.S. officials say such mistakes are feeding a debate within the intelligence community and the Defense Department about setting better guidelines for sharing of U.S. intelligence. Intelligence officials are divided on the issue. Some say the U.S. should withhold intelligence if it believes an ally might abuse the information. Others warn new rules could slow intelligence sharing during emergencies. In Uludere, December’s events continue to reverberate. Local men have reduced cross-border smuggling trips, slowing the local economy. Monuments to the dead have sprung up in villages. In Gulyazi, home to 13 of those killed, a 30-foot-high tent shelters a memorial where residents left handwritten messages next to portraits of the dead. On the outskirts of one village, widows and bereaved mothers gather regularly. One day last month, scores of women marched along a dirt track to a makeshift cemetery where many of the dead were buried. Chief of the Turkish general staff, Necdet Ozel, said the military was sharing information with prosecutors, according to a Turkish news agency. „We are not hiding anything,“ he said. Am 28. Dezember 2011 bombardierten Kampflugzeuge der türkischen Armee eine Gruppe von Schmugglern in Roboski/Sirnak. Eine Untersuchungskommission zivilgesellschaftlicher Organisationen und Abgeordneter der BDP sowie eine Delegation von Abgeordneten der Partei die Linke aus Hamburg stellten bereits im Januar 2012 fest, dass die Militärs in dem Bewusstsein agiert haben müssen, dass es sich bei den Bombardierten um Zivilisten handelte. 34 hauptsächlich jugendliche Menschen, starben bei dem Angriff. In einem Artikel im Wall Street Journal befassten sich nun die Journalisten Adam Entous und Joe Parkinson mit diesem Kriegsverbrechen. Eine amerikanische Drohne des Typs Predator hatte die Schmuggler mit ihren Maultieren zuerst beobachtet. „Als diejenigen Soldaten, die die Bilder Drohne auswerteten, Menschen in schweren Jacken entdeckten, sei nicht klar gewesen, ob es sich bei den Beobachteten um Schmuggler oder Guerillas handelte. Unsere Soldaten gaben die Informationen an die türkische Seite weiter und wurden dann aufgefordert die Drohne an einen anderen Ort zu steuern. Weitere Aufnahmen hätten jedoch Klarheit über die Identität der Schmuggler verschaffen können“, so ein Verantwortlicher aus dem amerikanischen Verteidigungsministeriums. Die Verantwortung der USA sei aufgrund des wachsenden weltweiten Einflusses sehr groß. Das Weiße Haus und der Kongress müssten sich die Frage stellen, wie weit den Verbündeten bei einer unkontrollierten Weitergabe von Informationen getraut werden könne. Das gelte insbesondere in Bezug auf die Drohnen, heißt es in dem Artikel im Wall Street Journal. Die Regierung Obama nutze diese fortschrittliche Technologie, um eine sicherere und kostengünstige Form militärischen Handelns zu etablieren. Zur Verringerung des Risikos für amerikanische Bodentruppen, würde eine sehr Enge Zusammenarbeit mit den jeweiligen regionalen Bündnispartnern gesucht. In Pakistan und Somalia, wo die Regierungen nicht gegen Militante vorgehen würden, stationieren die USA bewaffnete Drohnen und Sondereinheiten um vermeintliche Terroristen zu töten. Im Jemen werden die Drohnenangriffe dagegen von der Regierung genehmigt. In der Türkei, die eine moderne Luftwaffe einsetzt, würden die von Drohnen gesammelten Informationen lediglich weitergegeben. 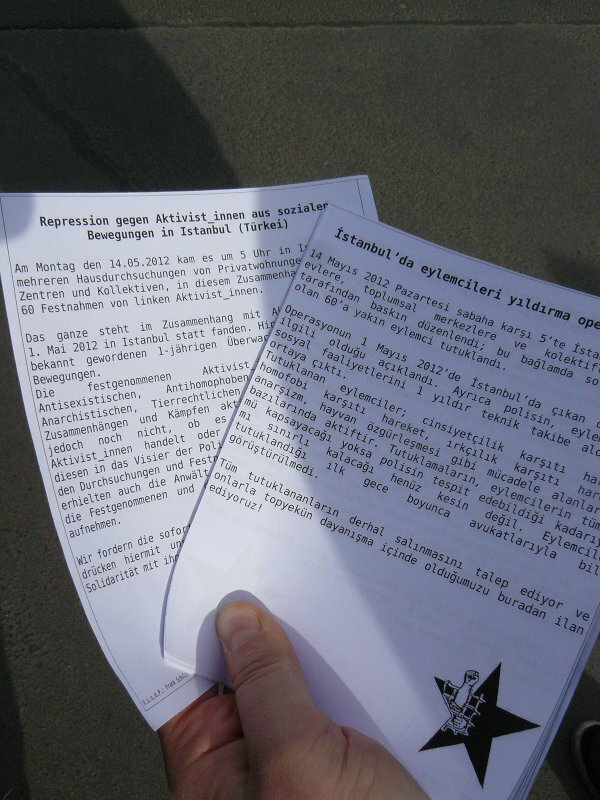 Seit 2007 liefern US Drohnen der türkischen Armee Informationen. Entscheidende Personen im US-Kongress wollen verhindern, dass diese Technologie zu weit verbreitet wird und kritisieren die türkischen Standards in Bezug auf militärisches Eingreifen. Daher wollen sie einen Export der Drohnentechnologie verhindern. Andere Kongressmitglieder würden gerne das militärische Bündnis in den Vordergrund stellen und die Türkei mit Drohnen versorgen. In dem Artikel lassen die beiden Journalisten auch Mitglieder der Familie Encu, aus der die meisten Betroffenen des Massakers von Roboski stammen, ausführlich zu Wort kommen. Deutlich wird dadurch das menschenverachtende Vorgehen des Militärs, und dass die türkische Armee sich darüber bewusst sein musste, dass es sich bei den von der Drohne Beobachteten um Schmuggler handelte. Die zivilgesellschaftlichen Organisationen und die Hamburger Delegation hatten bereits Anfang Januar anhand von Zeugenaussagen und der Auswertung von Spuren festgestellt, dass das Militär bewusst Zivilisten angriff. Türkische Abgeordnete hatten die Drohnenbilder ausgewertet und berichtet, dass die Menschen eindeutig als Schmuggler zu erkennen waren. Die örtliche Jandarma (Militärpolizei) war über jeden Gang der Schmuggler informiert, da sie illegale Zollabgaben kassierte. Zudem nutzen Guerillas keine großen Wege, wie die Schmuggler und bewegen sich nie in derart auffälligen Gruppen mit Maultieren. Auch das muss den für den Einsatz Verantwortlichen in Ankara bewusst gewesen sein. Die Verantwortlichen türkischen Militärs hätten mehrere Anfragen des Wall Street Journals nicht beantwortet. Auch der Innenminister und der Verteidigungsminister waren nicht zu einer Stellungnahme bereit, beschreiben Adam Entous und Joe Parkinson deren Verweigerungshaltung. Die Morde würden sich in jedem Fall negativ auf einen Konsens über die geplante neue Verfassung sowie eine Lösung der kurdischen Frage auswirken. Ein ehemaliger hochrangiger Militär, der bis vor kurzem nachrichtendienstlich mit der Türkei zusammen gearbeitet hatte, sagte, dass er und weitere Offiziere des Öfteren sehr besorgt über die türkischen Standards bei der militärischen „Zielauswahl“ gewesen seien. Türkische Offiziere hätten nicht selten, nur weil sie der Ansicht waren, dass es sich bei Zielpersonen um Anhänger der PKK handeln könnte, diese militärisch attackiert. All das halte die Regierung Obama jedoch nicht davon ab weiterhin den Plan zu verfolgen bewaffnete und unbewaffnete Drohnen an die Türkei zu verkaufen, resümieren Entous und Parkinson. Der Artikel bewirkte, dass der türkische Generalstab verlauten ließ, dass die erste Aufklärung von türkischer Seite stattgefunden hätte und der Artikel im Wall Street Journal nicht der Wahrheit entspräche. Entous und Parkinson vermitteln eine relativ differenzierte Sichtweise und lassen viele AkteurInnen zu Wort kommen. Das ist meines Erachtens sehr positiv und hat u.a. dazu geführt, dass das Roboski Massaker erneut öffentlich diskutiert wird. Die Journalisten haben dabei einige zentrale Fragen aufgeworfen. Nicht in Frage gestellt haben sie jedoch, ob militärische Interventionen und die so genannte Terrorbekämpfung überhaupt geeignete Mittel sind Konflikte zu lösen. Ausgeblendet wird auch die Taktik der Terrorzuschreibung als Legitimation zur Durchsetzung eigener Ziele. Ob Militärattacken durch Drohnen oder andere Formen der Aufklärung vorbereitet werden, ändert nichts am Ziel – der Vernichtung menschlichen Lebens. Im gesamten Mittleren Osten geht es dabei um die Durchsetzung geostrategischer Ziele und die Absicherung von Macht sowie der Ressourcen Öl, Gas und Wasser. Die Ursache-Wirkung Verhältnisse in Bezug auf die kurdische Frage werden nicht thematisiert – oder selbstverständlich verkehrt herum vorausgesetzt. Dem entsprechend thematisieren die beiden Journalisten auch nicht die jahrzehntelange Unterdrückung der KurdInnen, die zunehmenden Menschenrechtsverletzungen und die kolonialpolitischen Ausmaße des Konflikts. Dem entsprechend sind auch die AkteurInnen nicht zu Wort gekommen, die auf Frieden orientierte Lösungsvorschläge entwickeln – die BDP, die zivilgesellschaftlichen Organisationen, die PKK und Abdullah Öcalan, sowie die politische Linke in Europa, die sich in ihrem jeweiligen Rahmen für eine Demokratisierung der Türkei, einen Friedensdialog zur Lösung der kurdischen Frage, einen perspektivischen Aufarbeitungsprozess geschehenen Unrechts und die selbstbestimmte demokratische Organisierung der Religions- und Bevölkerungsgruppen einsetzen. Auch die Einordnung der Vorfälle in Roboski in den Kontext der zahlreichen Kriegsverbrechen der türkischen Armee und den in den letzten Jahren zunehmenden Menschenrechtsverletzungen wäre meiner Meinung nach eine sinnvolle Ergänzung, um ein weitergehendes Verständnis für die Situation und eine Analyse der Ausrichtung der Politik der AKP Regierung auf Gewalt, Feudalismus und Autokratie entwickeln zu können. Nachdem das 14. Strafgericht von Istanbul das einmonatige Erscheinungsverbot von Özgür Gündem aufgrund des breiten Protestes der Öffentlichkeit wieder aufgehoben hat, hat nun das 9. Strafgericht von Istanbul die Wochenzeitung „Demokratik Vatan“ mit einem Monat Erscheinungsverbot belegt. Das Gericht begründete diese Entscheidung damit, dass die Zeitung „Propaganda für die Organisation(gemeint PKK)“ betreibe. Die Zeitung habe in verschiedenen Ausgaben Erklärungen der PKK abgedruckt, sowie die Identitäten der bei militärischen Gefechten getöteten HPG-Guerillakräften veröffentlich. Zudem habe eine Schlagzeile bei der siebten Ausgabe der Zeitung „Unsere Gefallenen sind der Beweis unseres Kampfes“ gelautet. Zudem wurde gegen den Chefredakteur der Zeitung Arafat Dayan ein Verfahren eröffnet. Bei einer militärischen Operation des türkischen Militärs ist es an der Grenze zwischen Amed und Muş zu Gefechten mit den Guerillakräften der HPG gekommen. Hierbei wurde ein Polizist einer Spezialeinheit getötet und vier weitere wurden verletzt. Seit dem 14. Mai hat das türkische Militär im Dreieck von Amed-Muş-Cewlig eine großangelegte Operation, bei der auch die Luftwaffe beteiligt ist, gestartet. Dabei kommt es immer wieder zu Gefechten mit den Guerillakräften. In das Operationsgebiet wurden heute weitere Spezialeinheiten verlegt. Die Presse- und Kommunikationsstelle der HPG erklärte, dass die Guerilla als Antwort auf die ununterbrochenen Operationen des türkischen Militärs verstärkt Aktionen durchführe. So sollen bei drei verschiedenen Aktionen in Mêrdîn/Mehsert (Mardin/Ömerli) und Şirnex/Qilaban (Şırnak/Uludere) insgesamt neun Soldaten getötet worden sein. Bei der Aktion in Şirnex sei auch ein Guerillakämpfer ums Leben gekommen. Istanbul, Türkei – In Istanbul haben sich 12 Jugendliche bereit erklärt, den Wehrdienst in der türkischen Armee zu verweigern. Mit dieser Aktion wollen die Jugendlichen der Öffentlichkeit zeigen, dass sie einen Schritt zum Frieden zwischen dem türkisch-kurdischen Konflikt beitragen wollen. Außerdem kritisiert man die Wehrdienstbedingungen der türkischen Armee. Die türkische Armee ist bekannt für ihre harte und zum Teil unmenschliche Ausbildung von Soldaten. Es steht eine 15-monatige Grundausbildung an. Man kann von Glück reden, wenn man in dieser Zeit nicht in den Kampf gegen die PKK-Kämpfer antreten muss. Mittlerweile kann man sich sogar in der Türkei für rund 13.000 Euro von der Armee freikaufen, sofern man schon das 30. Lebensalter vollendet hat. „Glück für die Reichen – Pech für die Armen“, so lautet die Devise bei dieser Gesetzesänderung. Obwohl die Türkei mit 600.000 Mann unter Waffen die zweitgrößte Armee der Nato ist, will man weiterhin nicht vom Kriegsdienst abwenden. Nicht umsonst heißt ein bekanntes Sprichwort in der Türkei „Jeder Türke wird als Soldat geboren“ [Her Türk asker dogar]. Neben Aserbaidschan ist die Türkei das einzige Land im Europarat, das das Recht auf Kriegsdienstverweigerung nicht anerkennt. Seit 1927 besteht die Wehrpflicht für alle männlichen türkischen Staatsbürger. Die Möglichkeit eines Zivildienstes existiert nicht. Kriegsdienstverweigerung gilt als Straftat. Nach Paragraf 318 des Strafgesetzbuches, der die „Distanzierung des Volkes vom Militär“ unter Strafe stellt, bedeutet die Verweigerung „die Liebe der Gesellschaft verlieren“. Wer sich weigert, seinen Dienst anzutreten, wird von einem Militärgericht zu einer Haftstrafe verurteilt, in der Regel gefoltert und misshandelt und nach der Haft wieder an die zuständige militärische Einheit überstellt. Doch das ist nicht alles. Kurdische oder türkisch-alevitische Wehrdienstleistende werden zumeist von nationalistischen Soldaten unterdrückt. Oft kommt es sogar auch vor, dass Soldaten wegen ihrer Religion oder ihrer Herkunft umgebracht werden. In der Türkei spricht man dabei von “Selbstmorden”. Seit Jahren hat sich in der Türkei nun eine Friedensbewegung in puncto Militärdienstverweigerung gegründet. Unter dem Motto ” Vicdani Ret”, auf Deutsch “Verweigerung aus Gewissensgründen”, verweigern mehrere Personen den Wehrdienst. 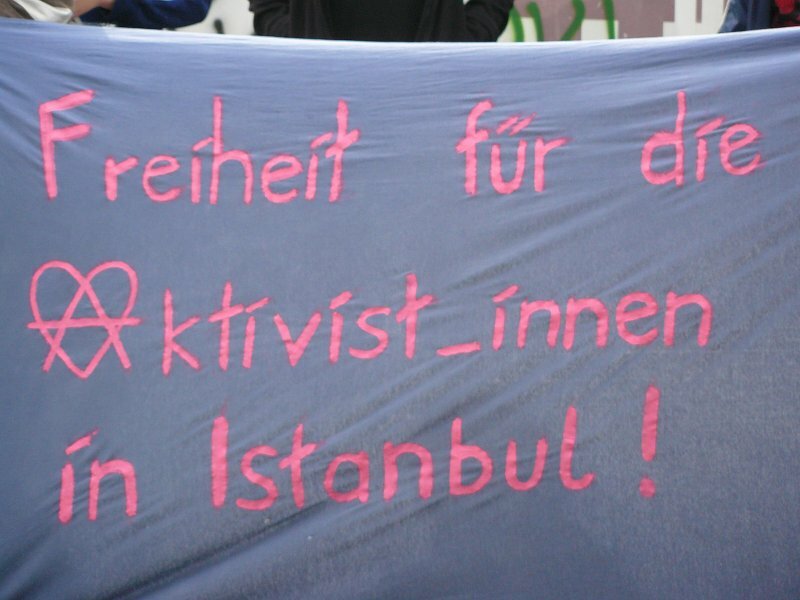 Unter dem selben Motto haben vor kurzem Jugendliche in Taksim, Stadtteil von Istanbul, eine Protestaktion gestartet. Diese Aktion wurde dadurch beendet, dass sich zwölf mutige Jugendliche dazu beschlossen haben, den Kriegsdienst zu verweigern. Einige Passanten applaudierten den Protestanten, doch einige Weitere übten Provokationen aus. Es wurden Slogans wie unter anderem “Geh nicht zum Militär – vergieße nicht das Blut deines Bruders”, “Verweigere für den Frieden” oder “Niemand wird als Soldat geboren”. Einige nationalistisch gesinnte Türken fühlten sich provoziert und schrien im Gegenzug den Spruch „Jeder Türke wird als Soldat geboren“. Die Protestanten waren unbeeindruckt und antworteten mit Slogans wie “Jeder wird als Baby geboren” oder “Glücklich der sich Mensch nennt”. Abschließend verkündeten die Kriegsdienstverweigerer, dass sie für ein Leben voller Frieden und gegen Militarismus, Krieg und gegen das Blutvergießen der Brüder sind. “In einer Phase, in der wir als Menschen dieser Region die höchste Stufe der Grausamkeit des Krieges ansehen mussten, erheben wir gemeinsam unsere Stimme gegen den Krieg, […] wir verkünden somit die Wehrdienstverweigerung aus Gewissensgründen.” so die Friedensbewegung. Laut erhaltenen Informationen hat der Iran am 21. Mai drei kurdische Gefangene in Sine erhängt. Es wird berichtet, dass zwei kurdische Gefangene im Hauptgefängnis von Sine erhängt wurden. Die Namen der Gefangenen, die beide aus der Stadt Ciwanro stammen, lauten Wirya und Sabir. Weiter wurde berichtet, dass kurdische Gefangene Hiwa Hewes Mihmed im Gefängnis von Kirmansan erhängt wurde. Hiwa Hewes Mihmed stammt aus der kurdischen Stadt Sine. Zwischen dem 16. und 17. Mai wurden im Iran 26 Menschen erhängt. Der Iran hat seit Beginn des neuen Jahres mindestens 250 Personen erhängt. Doğu Kürdistan’ın Sine ve Kirmanşah kentlerinde, 3 Kürt tutuklunun İran rejimi tarafından idam edildiği bildirildi. Edinilen bilgilere göre bu Sabah Sine Merkez Cezaevi’nde 2 Kürt tutuklu idam edildi. Ciwanro kentinden oldukları belirtilen, soy isimleri öğrenilemeyen Wirya ve Sabri adlı tutukluların, hangi suçlamadan ötürü idam edildikleri öğrenilemedi. Kırmanşah’ın Dizilebad Cezaevinde ise, Sine kentinden Hiwa Hewes Mihemmed adlı Kürt tutuklunun idam edildiği bildirildi. Öte yandan İran’da uyuşturucu kaçakçılığından suçlu bulunan 14 kişi bu sabah başkent Tahran‘daki bir cezaevinde idam edildiği bildirildi. İran’da 16-17 Mayıs günlerinde çeşitli suçlardan idam cezasına çarptırılmış olan 26 kişi idam edilmişti. İran, idamların çoğunu resmi olarak ilan etmediği için ülkede bu yıl içinde idam edilenlerin tam sayısı bilinmiyor. Bu yıl içinde idam edilenlerin sayısının 250’yi geçtiği tahmin ediliyor. İran, Çin’den sonra en fazla idam cezasının uygulandığı ikinci ülkedir. 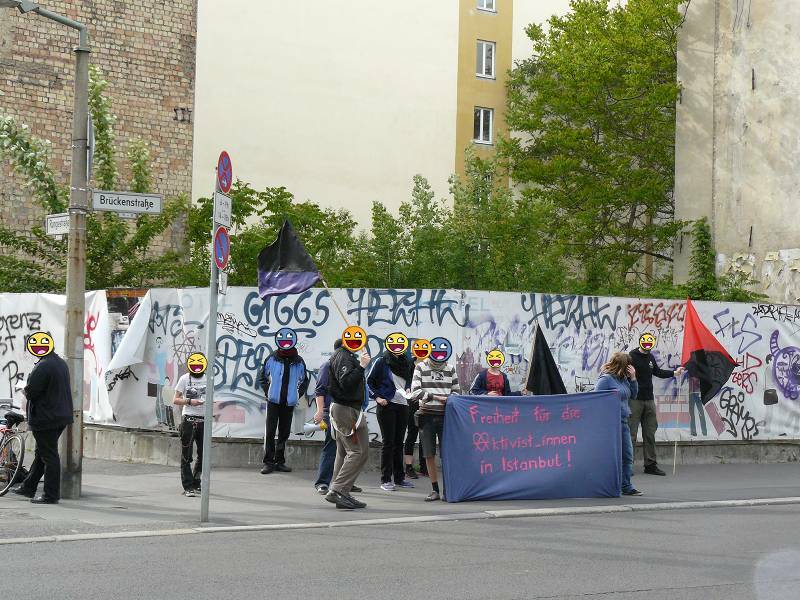 18.05.2012 günü bir grup Anarşist, Berlinde ki Türk konsolosluğu önünde gösteri yaparak, İstanbulda ki Anarşistler ile dayanışma için de olduklarını belirtiler. 14 Mayıs 2012 Pazartesi sabaha karşı 5’te İstanbul’da bazı evlere, toplumsal merkezlere ve kolektiflere polis tarafından baskın düzenlendi; bu bağlamda sol eğilimli olan 60’a yakın eylemci tutuklandı. Operasyonun 1 Mayıs 2012’de İstanbul’da çıkan olaylarla ilgili olduğu açıklandı. Ayrıca polisin, eylemcilerin sosyal faaliyetlerini 1 yıldır teknik takibe aldığı da ortaya çıktı. Tutuklanan eylemciler; cinsiyetçilik karşıtı hareket, homofobi karşıtı hareket, ırkçılık karşıtı hareket, anarşizm, hayvan özgürleşmesi gibi mücadele alanlarının bazılarında aktiftir. Tutuklamaların, eylemcilerin tümünü mü kapsayacağı yoksa polisin tespit edebildiği kadarıyla mı sınırlı kalacağı henüz kesin değil. Eylemciler tutuklandığı ilk gece boyunca avukatlarıyla bile görüştürülmedi. „Turkish police forces arrest 60 anarchists in night raids“ adı ile gelen maillin doğruluğu bulunmamaktadır. Operasyonlar, sadece sosyal anarşistlere veya anarko-komünistlere yapılmamıştır. Bütün anarşistlere yapılmıştır. Bundan dolayı düzeltir ve özür dileriz. 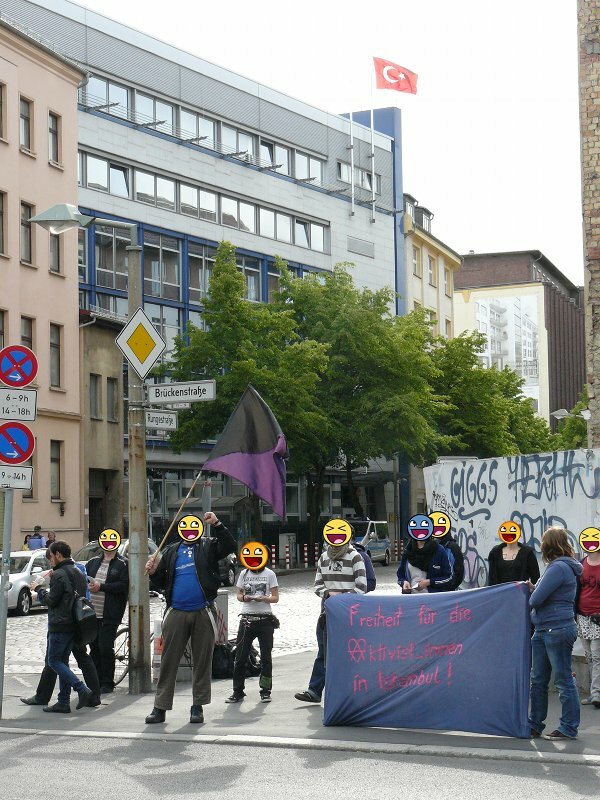 Du browst gerade in den efendisizler Weblog-Archiven nach dem Monat Mai 2012.